You are at:Home»Lex Pedia»Lex Articles»Does contractual employment hold something positive in store for employees? 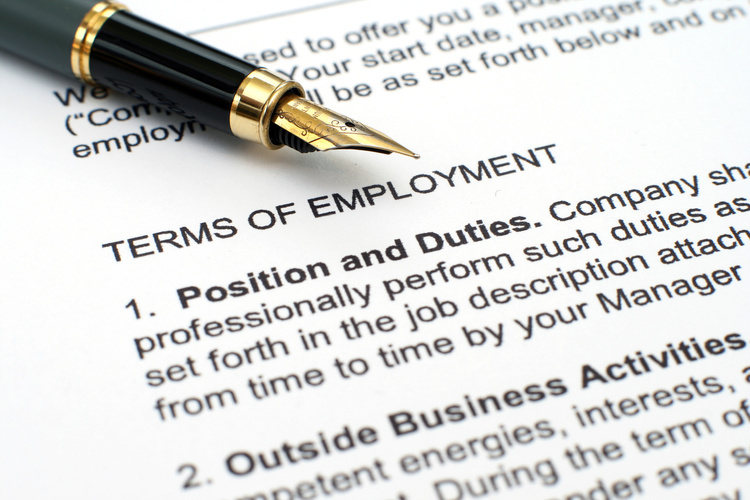 Does contractual employment hold something positive in store for employees? The point ‘contractual employment v/s permanent employees’ has been a point of debate since a long time in India, but it is drawing more attention towards itself in the present scenario because of the increased focus on industrialization. The point of contention that is attempted to discuss in this article is that, are there any positive aspects of contractual employment for the employees who undertake this type of employment. While employers prefer to have flexibility in workforce, workers prefer to have permanency status in employment. This situation arises often when employees are hired either through contractors or employees are hired on contractual basis. The two aspects that shall be discussed in this article shall be the hiring of contractual employment which is often an employment contract for a fixed term and another is the hiring where a third party is involved often known as contractor. Through there are certain employment where demand for labour is for a time, being temporary or seasonal such as in the construction sector, both contract labour and contractual employment is seen across sectors in manufacturing, to mining, to information technology and many others. One of the reasons that employers state for employing contract labourers is that it helps them replace the workers who are on strike and management is not in a position to accept their demands which result in paralyzing their operations. Although such situations emerge once in a while in an organization, in reality hiring on contractual basis exists beyond this limited time span. The liberalization of economy, has also drawn employers to a new aspect in employment – high attrition rates, which employers might be rarely experiencing, especially in the bargain able category of workforce. Times have now changed and the concept of ‘life time employment’ is reducing. Today, even the unionized workers are much more learned, more sensitive, amenable advanced technology and have willingness to change jobs and even locations. Today, more than the unions, the workmen themselves are aspiring to earn more in a given time and to have better standards of living. Although the advent of privatization and globalization has opened new opportunities for employees even for unionized categories, it has also increased the job expectations, diversity in the work environment and demands for skills, due to which a person might find oneself a misfit into an organization. It might either be related to the set of tasks he or she has to perform or the methods or even culture that is adopted to execute the tasks across the hierarchy. In such cases, contractual employment brings with it an opportunity to work for an organization on test case basis and then decide further whether to continue further in the same organization or not. A fix term contract gives an employee a chance to gauge the organization and decide whether or not to initiate a dialogue to become a permanent employee of the organization in future. In today’s dynamic economic environment, working on contractual employment is no less secure than working as a permanent employee of an organization. At times, highly skilled employees are hired on a contractual basis for their specialized skills or even to execute niche projects. On one hand it helps in taking up tasks only in one’s area of specialization but on the other hand it also helps in taking up the employment on test case basis to check whether new job roles can suit him or her to make it one’s career path in future. Contractual employment in the information technology sector at times might also provide flexible employment opportunities such as work from home assignments or part time job roles for a fixed term, which can help in managing work – life balance. For those who are fresh college graduate, the competition to enter into the job market through a contractual employment can be lesser which might help a person to be employed, even though for a certain period of the year. Although an employment under a contract has a fixed end date, there are chances where many employers might end up hiring the employees on contractual basis on their pay rolls as a permanent employee, provided they find potential in that person. For a person who wishes to remain cautious or is concerned about default by an employer on the part of their contributions to employees’ provident fund or medical benefits, contractual employment might be a better option as there are instances where organizations might not be providing for such benefits to employees who are hired on contract basis. Further, he or she can rest assured that the agreed amount shall be the take home or in- hand amount for that period of employment. Apart from all these aspects, whether contractual employment suits you, also depends upon your personality. If you are a person who likes to be task oriented than being social at the work place, contractual employment might be a good choice for you. This is so because, as other employees who know that you are there for a fixed period of time, they might not invite you into their inner circle, which might prevent you from getting dragged into the office politics and focus on task and have the pleasure of achieving your targets without getting distracted, thus preventing you from falling in the trap of stagnation of his/her efficiency thus indirectly contributing towards building a culture of openness to accept diversity of thoughts as well as that of ‘work is worship’.